Source: Review e-copy provided by publisher for an honest review. This is the 5th book in the Haven Point series, and I have to say I really love Christmas in Haven Point. I would love to catch the boat parade. I really enjoyed Snowfall on Haven Point. I expected the romance, but was not expecting a dash of mystery thrown in. Sheriff Marshall Bailey is certain his being hit by a vehicle was no accident, despite the initial investigation results claiming it to be just that. He is frustrated and annoyed that he is out of commission due to his injuries. As a man who does not like to ask for help, he is not at all happy when widow Andrea Montgomery walks through his door. The Christmas cheer she and her two children bring with them is contagious and it is just a matter of time before the Sheriff’s defenses crack. Marshall protests way too much about being able to do things on his own—but I get it. Marshall is a proud man and hates having to rely on others. He feels defenseless. He is the one who is used to doing the saving. He is also holding onto a pretty big secret from his past that he knows could be a game changer in any relationship he may develop. The emotional fallout for more than one person will be huge. I thought author RaeAnne Thayne handled this in a sensitive manner and felt the characters' reactions were realistic overall. Andie and her children have only been in town a few months. She knows that when people look at her, they see the assault victim that needed rescuing the previous summer, and not the strong woman she really is. There’s also the fact that she is a policeman’s widow, and getting into another relationship with a law enforcement officer is the last thing she wants to do for obvious reasons. Marshall and Andie try to fight the attraction, each struggling with their own internal arguments of why falling in love would be bad for them. They both would be bringing a lot of baggage into any relationship. I like that neither one of them is perfect. I also like that they are both very supportive of the other, even if they are trying hard not to fall in love. There is a mutual respect there that I think is important in any relationship. While the happy ending I was expecting was there, I appreciated how much the characters grew over the course of the novel, both as individuals and together. They had a lot of overcome, not all of it pretty. 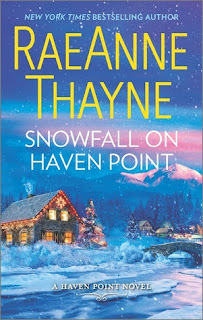 I can always count on RaeAnne Thayne to deliver a clean romantic and inspiring Christmas story, and Snowfall on Haven Point was no different. Thank you to everyone who voted for Snowfall on Haven Point in my November TBR List Poll! I love sweet stories like this during the holidays. Book Sage - Aw! As long as you are reading, that's all that matters. Sounds like the connection between these characters feels like something real and deep. Glad you enjoyed this story. Nina - Yes, these two were well matched, and I appreciated Thayne's care in creating them. Lark - It was fun! I am glad you enjoyed it too! Yay! I'm so glad you enjoyed it! I'm a huge RaeAnne Thayne fan and this was one of my favorites. My favorite is still Snow Angel Cove but this was pretty close. I love what she does with the characters and I really just loved everything about this one! Katherine - I still need to read Snow Angel Cove. I'm looking forward to it! I like contemporary romances that feel real. This one seems like one that would. You know, not perfect characters but nevertheless that makes them more likable and relatable! Iliana - That's a definite draw for me as well. This sounds like a good read. It seems the characters and blossoming relationship are well developed. Steph - I really like that about RaeAnne Thayne's books and characters.